These days, even so-called budget home stores can command a hefty price for even the simplest bath mat. But this doesn’t mean you’re left without fun, colorful choices or a place to rest your dripping feet! 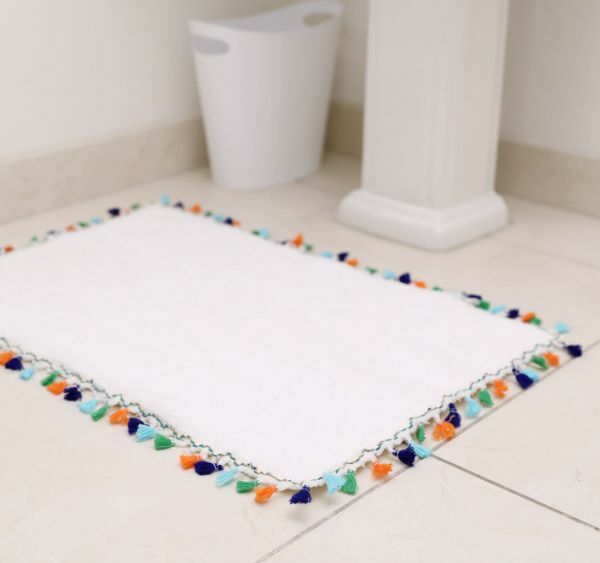 This bath mat project can be executed even by a novice seamstress or tailor, as it involves just two stitches. The rest is up to the crafter in terms of the towel's texture and trim (think small, multi-colored tassels, as in the video, or pompoms, rickrack or beaded ribbon). Bath towels are available in such plush textures and rich colors and patterns, this project can serve to finish off a beautifully designed bathroom or to refresh one in need of a pick-me-up. Whether you desire a pop of energetic fuchsia to enliven a space or a neutral mat for the Zen-inspired bathroom, this project will bring it home. Harmonize the mat with the surrounding color scheme and patterns, or throw matchy-matchy to the wind and go for bold and boho. 1. 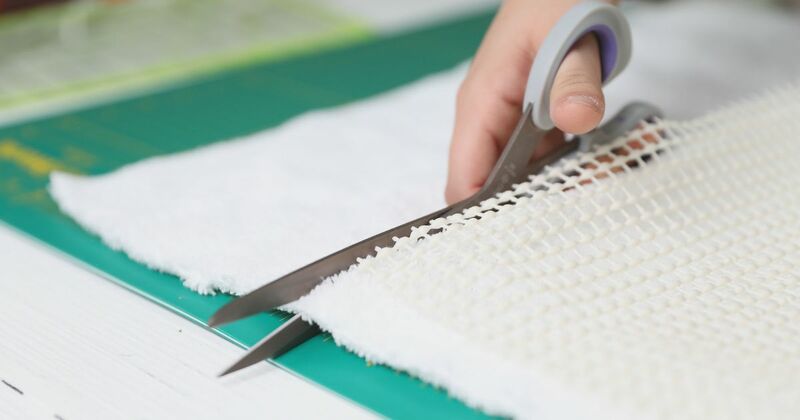 Place the nonslip mat material, which will serve as the rug’s backing, on top of a cutting mat. With a roller cutter, trim a piece for whatever sized mat you’d like to make. The one shown in the video is 20 inches by 32 inches. 2. Cut the towel to the same specifications, using the scissors. 3. Pin the nonslip mat to the towel, using straight pins along the four edges. The pins should be placed about 1 inch apart. 4. Before sewing the mat to the towel, place a piece of Scotch tape under the sewing machine’s footing to prevent the mat from wrinkling, catching and going out of alignment. 5. Using the sewing machine, stitch the mat to the towel, with the mat facing up. 6. Sew a pair of parallel lines, about 4 inches apart or your preferred width apart, on each side from end to end. 7. Trim any excess towel material or mat overage with the scissors. 8. Stitch over the edge of each side with a zigzag stitch. 9. Cut the trim you’ve chosen and pin it to the mat’s entire top edge. 10. Stitch the trim to the top side of the rug’s outer edge using a straight or zigzag stitch. 11. The rug is now ready for use. Relish stepping out of the shower as your feet take in the plush feel of this one-of-a-kind bathroom accessory! Share this creative sewing craft on Facebook.